I’d always known of the 2 kurmas, and gulab jamoon, as separate entities, and it was only once I hit high school that I realised there was any other way of thinking. Kurma growing up (in a primarily Indian village in Central Trinidad), was really the fat kurma, served as sirni (sweet) after Juma in the mosque on Friday, or at Muslim functions and weddings in little plastic bags (fancy boxes and paper bags developed in later years). There were only a couple families I knew who would sometimes make and bring the thin kurma, which in my mind, was the kind normally sold in shops A recent conversation with a friend who also grew up in Central area, provided a possible reason that we didn’t get much thin kurma growing up – being Christian and surrounded by both Muslim and Hindu neighbours, she remembers getting fat kurma from the Muslims and thin kurma from the Hindus. AHA! It all made sense. Thinking back to my sources of kurma, and checking with Mom, this explanation was indeed valid. In fact, back when lines between Muslim and Hindu Indo-Trini foods were more defined, you wouldn’t ever get thin kurma from a Muslim household! Muslims served sawine, halwa, maleeda and fat kurma. I used to wait to go to Hindu weddings to get karhi (the dhal with pholourie-like things in it) and even to this day some traditionalists say channa and aloo is “Hindu food”. Mom says long-time, paratha (buss-up-shut) was the roti of choice at Muslim weddings, while dhalpuri was the only roti served at Hindu weddings. Fortunately, I firmly believe if food is good and halaal, there should be no other distinctions In any event, gradually over time, these lines in the sand have been eroded to the point that people outside or within these communities never even think about such categorisations. But back to the fact that there are 3 fried sweet dough things! Thin Kurma is made from the least rich of the doughs, which is rolled out flat and cut into thin, rectangular strips, deep fried, then coated in a sugar syrup (paag). Simply Trini Cooking has an excellent step-by-step recipe with photos. Fat Kurma is a little richer and should taste of some spice (cinnamon, clove and ginger). The dough is usually rolled into ropes, which are cut at an angle into diamond-like cuboids, deep-fried and coated in sugar (usually ending up in white, clumpy, oh-so-sweet sugar all over). It should only be crunchy on the outside, and soft and a little fluffy on the inside. (Trini) Gulab Jamoon is fried balls of a dough enriched with spices, butter and condensed milk, then glazed with sugar. Traditionally made in elongated ovoid shapes, hand-rollled individually (see photo on the right). But onto the FAT kurma recipe! 1. Mix flour, spices and margarine completely until it looks like fine breadcrumbs. 2. Add half the tin of condensed milk, half the ginger and the evaporated milk and water and mix well. 3. Knead the dough until it is smooth. 4. Separate the dough into 4 balls and knead again to a smooth surface and allow to rest. 5. Put oil to heat in a heavy pot. 6. Roll out a ball to 1/2″ thick and cut into 1 1/2″ strips. Roll these strips slightly into ropes, and cut at an angle into 1 1/2″ pieces. Alternatively, don’t roll into a rope but cut the strips, turning/twisting the strip after each cut. 7. Fry the pieces in batches until golden brown. Repeat for each ball. 8. Leave the kurma in a large basin to cool and continue until all the balls are fried as directed above. 9. Divide the unsugared Kurma into 2 or 3 basins and have sturdy spoons for mixing. 10. Put sugar and one cup of water to boil in a large pot with the remaining ginger until the sugar mixture spins a thread when dropping from a spoon. 11. At this stage add the remaining half tin of condensed milk and boil again until the mixture spins a thread. 12. Divide this mixture equally between the basins and stir continuously until the kurma is evenly coated. You’ll need help to mix all kurma at the same time or the paag will harden. Unless you just keep the kurma in one large basin and turn it all at the same time. 13. Transfer to another bowl or tray to spread out a bit so that the kurma doesn’t clump together. This is usually served in little clear plastic bags, but you can go ahead and pop them in just like that. Go brave! ** oh, harken back to school bazaar days promising many Indian Delicacies for sale! This entry was written by Chennette and posted on May 14, 2009 at 8:02 pm and filed under 'Id, Eid ul Fitr, food, Ramadan, recipes, Trinidad and Tobago. Bookmark the permalink. Follow any comments here with the RSS feed for this post. Post a comment or leave a trackback: Trackback URL. I’ve tried thin kurma but never the fat ones. Sounds great with the addition of the ground spices. kurma? wow. in india kurma or korma would mena a spicy curry. this looks fantastic. re: the thai restaurant at edinburgh, i don’t remember the name. it was across the street from our hotel (don’t remember that name either). You make my heart sing! !Thanks for the recipe and stories! I am definitely going to try this. Thanks so much Chiberdee! Hope it turns out well. Great little history lesson here. I, for one, am happy that the lines between muslim foods and hindu foods have become so blurred since fat kurma is my favorite. Although I grew up in a Christian household, my mother’s relatives were all hindu. So for Divali, my sister and I would insist that we visited those who made the fat ones! The fat kurma with the almonds or sometimes with grated coconut I made was called Khaajah by my mother……I must really make some to take to the masjid on Friday Insha’Allah. Of course these were not shaped like the Kurma but more diamond shaped, thinner and with a layered look…..Lilandra would take the pics….. Thanks people I tried to ignore mentioning that I hadn’t posted for almost 5 months…didn’t want to jinx anything! Aka – I think sometimes the doughs could be made the same for thin/fat but people always made a big deal when i was growing up about the thin one being harder to make successfully, so it’s left that impression in my mind that it’s very different. You can tell when I am mostly talking about my impressions 😀 as opposed to substantiated knowledge, since I have never made thin kurma! My Aunt would make her ‘fat’ kurma with coconut milk as well as some of the spices you mentioned. Then it went in the oven to bake before being coated in the syrup. Oh, YUMMY-OH! Don’t get me wrong. 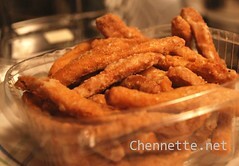 THe thin crunchy kurma has it’s place, but finding a good one in the store is hard. 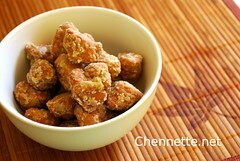 The last time I made kurma (thin), I TOTALLY messed up the syrup and the darned things got all soggy – doh! Must try again! PS: Was my B-day yesterday and my mom sent me Jalebi and pepper plum from Trinidad.. . .time for a sweet/savory overload tonight! Mom say she making, AND the one with almonds for you to take pictures! Mashaallaah ah glad to see yuh back and ah like how yuh clarify that ‘kuma’ discrepancy because as a true ‘tong’ boy all I knew was the thin kurma (because that is what people sold). It was not until I was teen that I realized there was two types of ‘kuma’ and its only on occasions like eid or some wedding I might be fortunate to get some nice ‘fat’ kurma, but I can’t really remember buying it though except once or twice in Cuerepe by the Cunupia taxi stand. The other reason ah glad you bring this up topic is because kurma is like my favorite sweet and i was meaning to ask you where in Trini sells the best of both kinds as a breddrin should be coming back in a week and I would really like him to bring some for me. And yeah I definitely feel you on that, ‘I firmly believe if food is good and halaal, there should be no other distinctions :-)’ but once a Hindu friend invited me to a Divali event in St. James and I ate their aloo pie…..to say the least my stomach was uneasy for days – I don’t know what it was but I was like how could these folks fry pie in the same oil they use to light deyas (i.e. coconut oil)??? Point is sometimes its a difference. Anyways don’t forget meh inshaallaah. Well this certainly brings back memories of my own childhood living in a Muslim family, with a Catholic father and surrounded by Hindu neighbours. My Grandmother, mother, aunts et al made “fat” kurma and gulub jamoon (with raisins or prunes in the middle) for special occasions and we got “thin” kurma from the neighbours along with chatiagne, peyra and other such delicacies. And yes, you used to get dhalpouri at all Hindu observations and paratha at Muslim things and it only blurred when roti shops started opening everywhere. Thanks for the walk down memory lane! well its a month i came back from t’dad so i am bit home sick i am just fed up with the cold life in canada. just wish i was back home in t’dad probaly next year i will make decision to moved back imissed the lifestyle there although my parents are gone and one brother. i missed my parents alot may allah bless them where ever they are. i missed her good cooking when go back home. OK, I know that I am more than a year late but I have some young relative coming from France to visit and was brousing to see what sweet Guyanese treat to make for them. I love the hard (thin?) 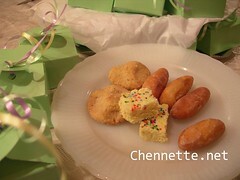 mithai (Kurma) but did not think that they wouldso when I came upon your soft one I was delighted. I had forgotten all about it. I know that it is not any of the eids, but I grew up in the countryside in Guyana and we made anything at any time that we feel like eating it. I am beginning to drool already and i still have two weeks to go. I am diabetic so I can’t eat it too much or too often but I m,ake up by using whole wheat flour. It works fine. Hi, I have to say that this is definitely a traditional recipe. I left Trini in 1976 and I miss the food. I don’t get the oppty to visit much but I cook all the dishes my mother cooked. I don’t have the exact touch but it is great thus far. My children who are 1/2 Irish love the food. Kurma is a special dish in this house. I taught my son (7) how to make Roti. He knows how to kneed the dough, roll it out and I have to place it on the Tawa. My mother recently visited and we cooked for 2 days (all of it we kept in our freezer!). Hi Lisa, yes half the condensed milk goes in the dough and the other half goes into the phaag with the sugar and water. It makes for a thicker sugar coating. How much sugar are you supposed to use? There’s no mention of it in the dough recipe and u dont specify how much is supposed to used in the paag. Hi Naomi. If you check the recipe you will see the dough doesn’t use sugar but condensed milk. This makes it sweet enough, that is why there is no mention of how much sugar for the dough. The list of ingredients also specifies 1 kg granulated sugar (plus one cup). This is the amount of sugar used for the paag. Hello my friend. First, please don’t ever delete this website as it has all the recipes I need. Second, I can’t seem to find where you add the ground spices. Am I just missing it? I’m not sure if you’ll get back to me, but would really appreciate it. Going to try to make this in the next hour. Sorry I didn’t get back before you made it. Hope it came out ok! You’re right…I don’t seem to have put where to add spices…oops. You add it in the dough. Editing now. And while I don’t post right now I am maintaining the site and I do respond.